0:08 unnamed man: An Assad’s criminal gang was caught in Idlib. 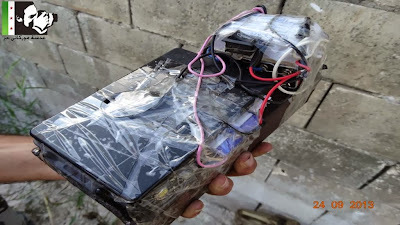 It was sent by the Militrary Security Branch (one of Assad’s various security apparatuses) and was planning to set a number of car bombs in the liberated areas in northern Idlib. They were taken to the Sharia Court. The car bombs were to be put near mosques. The truck bomb was detonated in a remote area. 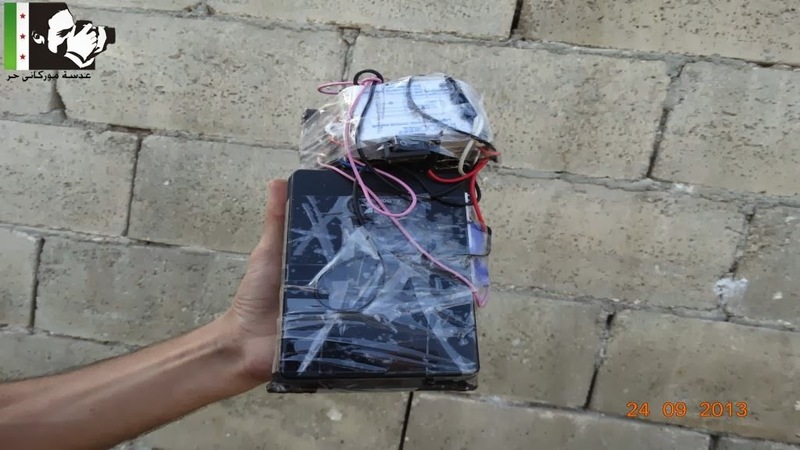 0:51 the cameraman explains how the explosives were hidden in a box made of metal plates and that the truck looks empty. 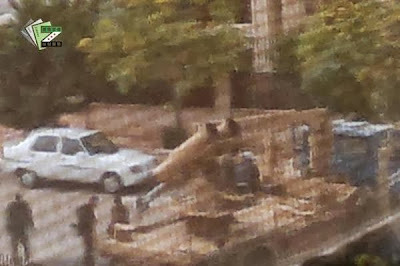 2:35 the truck bomb will be detonated because it was too difficult to defuse the bomb. The use of IEDs by the Syrian army seems to have become increasingly widespread in the past year, with a number of examples being posted online (see here), and it's not the first time a car bomb has been allegedly used to target a mosque, with this example from July 2012. As always, it should be made clear it's difficult to independently verify the claims made the the opposition in these circumstances. Earlier this week an article was published by Al Akhbar, Questions Plague UN Report on Syria, making a number of claims about the UN report, including "There is not a single environmental sample in Moadamiyah that tested positive for Sarin." and "It is scientifically improbable that survivors would test that highly for exposure to Sarin without a single trace of environmental evidence testing positive for the chemical agent.". This is then used to claim that the 140mm artillery rockets fired at Moadamiyah were not carrying Sarin, as widely reported, and that the trajectory of these rockets, as per the UN report, which crosses over with the trajectory of other rockets fired at Eastern Ghouta over the Syrian army’s Republican Guard 104th Brigade base, is indicative of nothing, as the munitions did not contain Sarin. One of the chemical weapon experts quoted in the article is Dan Kaszeta, who has responded to the article with a FAQ he's published online. Q: The article claims "not a single environmental sample in Moadamiyah that tested positive for Sarin." - What is your reaction to this? I consider this statement to be a misleading half-truth that “cherry picks” from the UN report. It is true in respect to the fact that no actual Sarin was found in the 13 environmental samples taken from Moadamiyah. But the samples show DIMP, IMPA, and MPA, all of which are strong indicators of Sarin. The environmental samples are clear indicators that Sarin was used because of the clear presence of chemicals that are clearly decomposition products (IMPA, MPA) and impurities (DIMP), all of which persist longer in the environment than Sarin itself. The 140mm rocket alleged to have been used in Moadamiyah is patently smaller than the devices used elsewhere. Therefore, there it would carry far less chemical agent than larger devices. 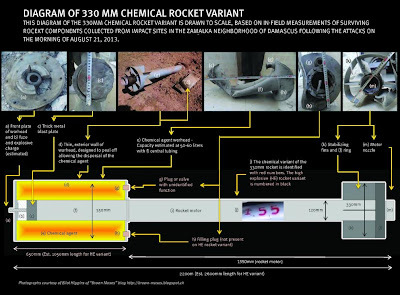 There may have been less Sarin to find at each individual site where the 140mm rocket was used. The UN report states that they did not find the actual warhead. 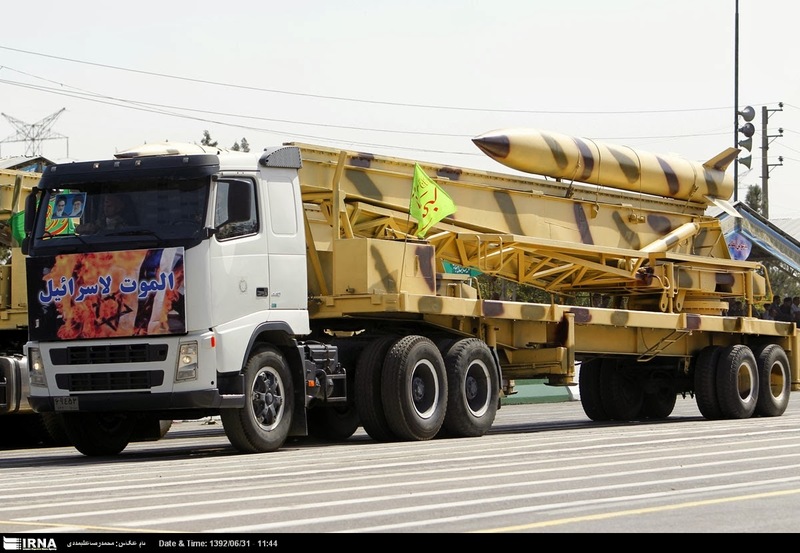 Their photos are of the rocket section, not the agent-carrying portion of the rocket. The lack of a payload-carrying section indicates to me that the explosive bursting charge of the rocket functioned as intended. The US Army used approximately a 3.3:1 ratio by weight of Sarin to conventional explosive in the US’s closest analogue to the 140mm rocket, the M55 115mm rocket. As a Soviet-designed 140mm rocket carried approx. 2.2 kg of Sarin, a comparable ratio would indicate an explosive charge of 650-700 grams of explosive. From my own direct experience with explosives in my military and law enforcement training, such a quantity would shred the rocket’s warhead section into small fragments. 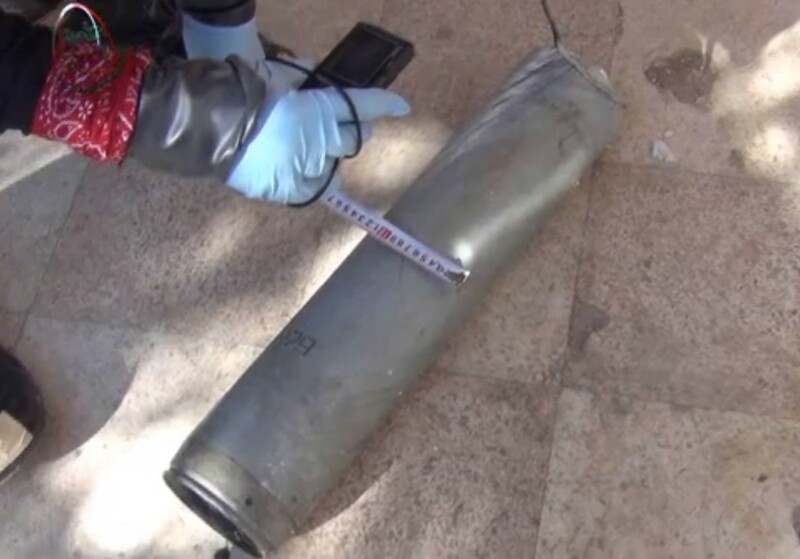 As metal fragments are a likely place to collect a Sarin sample, the fragments at Moadamiyah may have been too small to locate or indeed too small to contain an effective sample of the agent. A fully effective and efficient explosive dissemination of a 140mm rocket carrying Sarin would create an aerosol of finely divided droplets, with little or no pooling or puddles of Sarin, making it harder to find a trace of actual Sarin. This factor presumes that the munition efficiency (the percentage of Sarin dispensed as an aerosol to create rapid effects) of the 140mm rocket is higher than that of the larger system used elsewhere. Based on my knowledge of chemical weapons design, I believe this to be the case. If the location in Moadamiyah under investigation had been exposure to more ventilation, more moisture, or both, the evaporation and degradation of Sarin would have been increased relative to other locations. With the information available to me, I cannot know whether this was the case or not. Q: The same article claims "It is scientifically improbable that survivors would test that highly for exposure to Sarin without a single trace of environmental evidence testing positive for the chemical agent." How do you answer this question? This is an untrue statement unsupported by the facts. The statement appears to betray an ignorance of the relationship of Sarin to its degradation products. As I state above Sarin degrades into IMPA and/or MPFA. IMPA is a direct daughter compound of Sarin. Q: The article also states that sarin can last "for months, sometimes years in the environment." Could you clarify the situation where that would be the case? Evaporation. Sarin has a non-trivial vapor pressure and a relatively low “latent heat of vaporization” (the energy required to go from liquid state to vapor state) at normal temperatures. Therefore, Sarin is a volatile liquid, and it will evaporate into the air if given the chance to do so. In open contact with the air, Sarin liquid cannot be expected to last for more than a few hours. 30 minutes at 15º C is stated by one German authority. In situation where the liquid Sarin is trapped and not exposed to air, it may persist for some time. Hydrolyis. Sarin will decompose into IMPA or MPFA in contact with moisture. Sarin not in contact with moisture, such as humidity in the air or soil, will last longer. Thermal decomposition. Sarin thermally decomposes rapidly above 150º C.
Sarin without direct contact with air or water or extreme heat simply has less means to evaporate or degrade. Sarin trapped in a way where it has no access to air or water will significantly increase its persistence in the environment. In addition, liquid Sarin absorbs into some surfaces. I find samples 27 and 28 particularly revealing, as they are from window seals/gaskets. This is exactly where I would look for Sarin. Q: Would you agree with the UN's claim on page 5 of the report that "The environmental, chemical and medical samples we have collected provide clear and compelling evidence that surface-to-surface rockets containing the nerve agent Sarin were used in Ein Tarma, Moadamiyah and Zamalka in the Ghouta area of Damascus."? Yes. I believe that the environmental samples are conclusive. The medical evidence is somewhat less conclusive in my mind, but only because the methodology by which the samples were analyzed is not clearly stated. Q: Considering the evidence in the UN report, do you agree with the articles conclusion that the 140mm artillery rockets fired at Moadamiyah did not contain Sarin? I do not agree with this conclusion. I can think of no other reason to account for the presence of DIMP and IMPA at the scene. Q: The article quotes you as saying "environmental and medical evidence cannot conceivably be considered a scientifically or statistically accurate sample of the population of affected victims. It would be considered scientifically unsound to draw widespread conclusions based simply on this sample." Could you expand on what you mean here? The only point I am making with that statement is that the sample population of 36 individuals is too small to be considered statistically adequate to represent the entire population of thousands of people affected by the attacks. It is just too small a slice of the theoretical data set to allow one to draw widespread conclusions about the whole incident. A statistician could shed more light on the science behind this, as it has been over 20 years since my last statistics class. My statement should not be taken to mean that we cannot learn from the data collected on the 36 people. Nor should my original statement be taken as a statement that I do not believe Sarin was used. As I state in my earlier report, I firmly believe Sarin was used, based on the evidence of the UN Report. My statement just means we can’t apply those particular findings based on 36 people to the broader population of many thousands with any expectation of accuracy. Q: The same article also highlights you're concerns over the mixture of symptoms not matching that of past sarin attacks; "Is it possible that we are looking at exposure to multiple causes of injury? Were some of the examined victims exposed to other things in addition to Sarin? I am not stating that Sarin was not used. It clearly was. My point is that it is either not behaving as we have understood it in the past or that other factors were at work in addition to Sarin" Could you expand on that point? The point I was trying to make is as follows: One logical explanation behind the diverse and variegated signs and symptoms noted in the report may be the fact that we are looking at exposure to more than one thing. In simpler terms, did other chemicals cause injury in addition to Sarin. There are numerous ways in which this could be the case. One possibility is widespread presence of smoke and other respiratory irritants. One theory I would like to explore is binary chemical weapons. A binary chemical weapon is one that combines several components to create the chemical agent desired, generally by mixing the two chemicals in flight on the way to the target. Both the US and Soviet Union developed this technique during the Cold War. For example, a binary weapon could create Sarin. One excellent example of this was the M687 artillery shell developed by the US Army. The M687 was designed to combine two canisters mid flight after being fired from a 155mm howitzer. One canister contained DF (Methylphosphonic difluoride – see above) while the other canister contained a mix of isopropyl alcohol and isopropyl amine. The two canisters would mix to create Sarin. The actual success of inflight mixing was very difficult to achieve and was the result of much research, development, and test firing both with simulant chemicals and live agents. 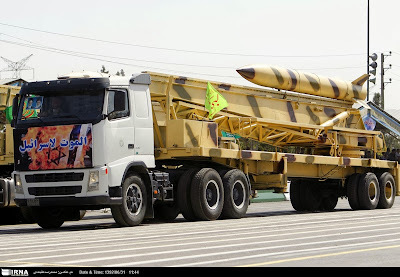 My theory is that the larger 330-360mm rocket may have been designed as a binary agent to combine chemicals to create Sarin. However, the ‘dark art’ of perfecting the inflight mixing may not have been learned by its designers. In such a case, the device would disseminate a mix of chemicals upon impact or detonation. Some Sarin would be created, but an awful lot of precursors would be present. None of these precursors are pleasant substances and their general proclivity to cause respiratory and eye irritation could explain the relatively ubiquitous but generic respiratory and eye symptoms. In addition, the presence of MPFA at the locations tied to the larger rocket, but not the smaller rocket, could support this theory. This is because MPFA is a direct decomposition product of DF, the Sarin binary component. 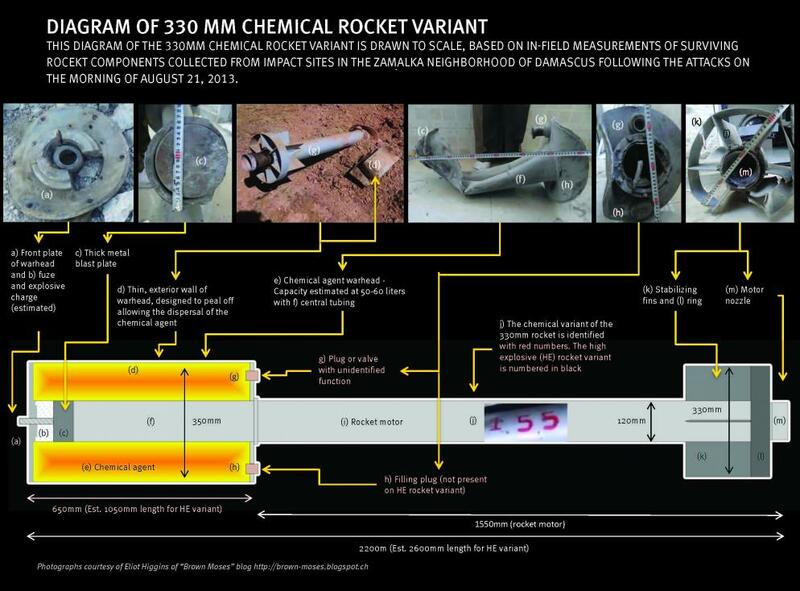 Q: Wouldn’t the attackers just mix up the chemicals, THEN pour them into the rocket? There’s no theoretical reason why that couldn’t happen. It’s just that it seems a dim idea to do it that way. Taking dangerous chemicals and mixing them in open air to create an even more dangerous chemical, which would evaporate and cause a downwind hazard seems like a difficult thing to get soldiers to do, and that’s speaking in my capacity as a former Chemical Corps Officer. Anyone forced to do do would probably rush and make mistakes or do a poor job of it. Mixing binary components before putting them both in the weapon would negate all of the advantages of having a binary weapon in the first place. Using pure, unitary agent would achieve much higher efficiency at the same or lower (non-trivial) level of danger to the troops handling the agent. I see little point in a binary system that isn’t an in-flight mixing technique. All these questions and more can be found on Dan Kaszeta's FAQ. Since publishing my last post, Evidence Of The Syrian Army Using Munitions Linked To The August 21st Sarin Attack, which examined evidence of the high explosive variant of the munition linked to the August 21st Sarin attack (which I've dubbed UMLACAs) being fired from Mezzeh Airbase in Damascus, I've being searching through videos from the surrounding area, searching for more examples of the rockets being fired from the airbase. 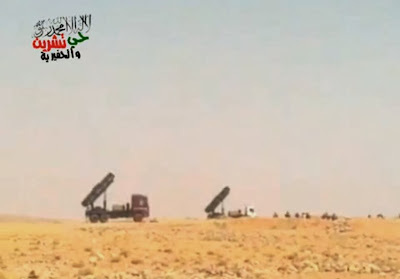 What I've found are six videos from December 2012 and January 2013 showing the launchers for the UMLACAs in operation inside Mezzeh Airbase, clear evidence that the Syrian military had the equipment required to launch the munitions linked to the August 21st Sarin attack. The below image shows the clearest view of the munition, and I've adjusted the levels on the image to make the shape as clear as possible. It seems there's an ever increasing body of evidence confirming the Syrian government are capable of launching the rockets used in the August 21st attack, and that they've been using those launchers since at least November 2012. 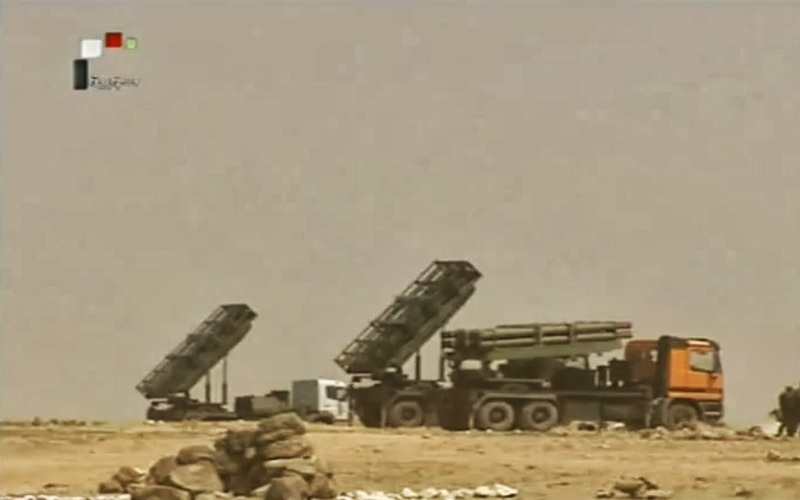 These videos are from one location in Damascus, but we know there's at least one video showing an UMLACA launch from Qadam railway station in Damascus, so it might be time to revisit some old videos showing rocket launches, and giving them an extra close look. 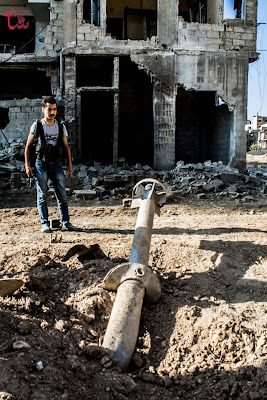 Since the UN report into the August 21st sarin attack confirmed the use of a previously unknown munition in the attack, which I had previously named the UMLACA (more details here), there's been a lot of debate about whether or not the Syrian army has such a munition. There's been multiple videos of the munitions posted online by the Syrian opposition, and they've been consistently described as being fired by Syrian government forces. From those videos, I've been able to identify at least two types of these munitions, one type linked to the August 21st sarin attack and past alleged chemical attacks, and a second, high explosive, type. In the video it's claimed that the munitions are fired from Mezzeh airbase, and it's actually possible to confirm they are coming from the direction of Mezzeh airbase. At the start of the video we see the launch, and the outline of the hills behind it. The structure at the top of the hill is the HQ of Maher al-Assad's 4th division, which can be seen here on Wikimapia. A report from the Institute for the Study of War examining the situation in Damascus in December 2012, shows that the area north of Daraya, including Mezzeh airbase, and the 4th division terrain to the north, were under the control of the Syrian army, and it seems, from what we can see in the above video, that the UMLACA was fired by Syrian government forces. This not only shows the Syrian army have been using the munitions, but they've been using them since December 2012. At the end of last week I published a statement from Dale Gavlak, distancing herself from the the Mint Press article "Syrians In Ghouta Claim Saudi-Supplied Rebels Behind Chemical Attack", published by Mint Press with Dale Gavlak and Yahya Ababneh on the byline. Basically I helped Yahya Ababneh, who traveled to Gouta, to write what he saw and heard. He mainly met with rebels, of course, the father of one of the rebels killed and doctors treating victims in the area. He has traveled to Syria numerous times. As you know Mint Press News is more of an advocacy journalism site and it seems to be the most likely to publish such a piece. Dale Gavlak has sought to make a public statement from the beginning of this incident and now is able to do so. Email correspondence between Ms. Gavlak and Mint Press News that began on August 29 and ended on September 2 clearly show that from the beginning Ms. Gavlak identified the author of the story as Yahya Ababneh, a Jordanian journalist. She also made clear that only his name should appear on the byline and the story was submitted only in his name. She served as an editor of Ababneh’s material in English as he normally writes in Arabic. She did not travel to Syria and could not corroborate his account. Dale Gavlak specifically stated in an email dated August 29 "Pls find the Syria story I mentioned uploaded on Google Docs. This should go under Yahya Ababneh's byline. I helped him write up his story but he should get all the credit for this." Ms. Gavlak supplied the requested bio information on Mr. Ababneh later that day and had further communications with Mint Press News’ Mnar Muhawesh about the author's background. There was no communication by Mint Press News to Ms. Gavlak that it intended to use her byline. Ms. Muhawesh took this action unilaterally and without Ms. Gavlak's permission. After seeing that her name was attached to the article, Dale Gavlak demanded her name be removed. However, Ms. Muhawesh stated: "We will not be removing your name from the byline as this is an existential issue for MintPress and an issue of credibility as this will appear as though we are lying." Mint Press News rejected further demands by Dale Gavlak and her legal counsel to have her name removed. Her public statement explains her position. Thank you for reaching out to me in regards to statements made by Dale Gavlak alleging MintPress for incorrectly attributing our exclusive report titled: “Syrians in Goutha claim Saudi-supplied rebels behind chemical attacks.”Gavlak pitched this story to MintPress on August 28th and informed her editors and myself that her colleague Yahya Ababneh was on the ground in Syria. She said Ababneh conducted interviews with rebels, their family members, Ghouta residents and doctors that informed him through various interviews that the Saudis had supplied the rebels with chemical weapons and that rebel fighters handled the weapons improperly setting off the explosions. @snarwani @Brown_Moses #Syria Mint Press journalist Yahya Ababneh claims to work for Al Jazeera. But Al Jaz web has no record of him. Following yesterday's statement from Dale Gavlak on an article published by Mint Press she claims wrongly used her name in the byline, I've now received the following email from Dale based on a statement from her lawyer further clarifying the situation. Early yesterday morning I received an email pointing me to three videos that had been posted on LiveLeak, claiming to show the Syrian opposition group launching the August 21st sarin attack. I posted the videos on my blog, and highlighted the dubious nature of the videos. 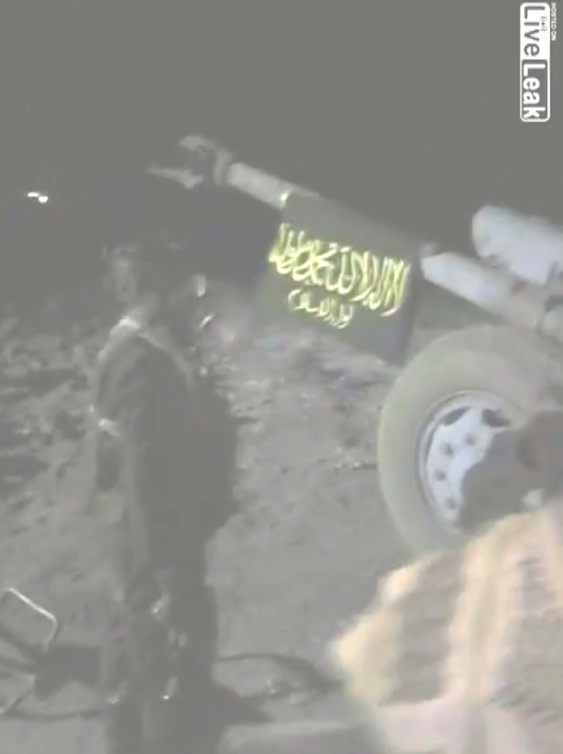 Having spent the last two years examining videos from the Syria conflict on a daily basis, these videos appear suspicious for a number of reasons I detail on my blog post, and are totally unverifiable. Thabang Motsei - ......Meanwhile a prominent Syrian blogger known as Black Moses has posted footage allegedly showing chemical weapons being used by rebels. Let's get the details from our correspondent Paul Scott here in the studio. " Paul Scott - The blogger is a staunch critic of Damascus and a staunch critic of President Bashar al Assad's regime and in the past he has monitored all sorts of news sources and claims and counter claims emerging from the Syrian Civil War to use it as a stick to beat the Assad Government with and implicate Assad in all sorts of atrocities. But it is interesting now that he has posted a video on this blog that suggests that it actually could be the Syrian Opposition that had been using these chemical weapons. It represent a slight shift in focus from what the narrative that the blog has been taking in recent weeks. Thabang Motsei - So this Brown Moses that we were talking about what are experts saying where the rebels could have obtained these chemicals from. To be absolutely clear, I do not consider these videos to be reliable evidence of anything. They came from irregular sources, and are filmed in a way not consistent with videos posted previously by Liwa al-Islam, among other issues. I do not support Russia Today's use of the credibility of my work to prop up videos I consider to be highly dubious. I believe all credible evidence points to the Syrian military being responsible for the August 21st attack, and have produced large amounts of work examining the evidence that supports that conclusion, which can be found here. Since the UN report into the sarin attacks on August 21st linked two munitions to the attack, there's been various claims made about who could have been responsible. The New York Times summarises a number of key pieces of information that points towards the Syrian military being responsible here, and for my own part, I've stated I've never seen either of the munitions used, the M14 140mm artillery rocket, and the munition I named the UMLACA, in the hands of the Syrian opposition. Chemical weapons were delivered with munitions not used by rebels: This claim includes referencing "Syria watcher" Eliot Higgins also known as "Brown Moses," a UK-based armchair observer of the Syrian crisis who has been documenting weapons used throughout the conflict on his blog. These, and similar videos, have been cited by a number of people as evidence that the opposition could have launched 140mm rockets. 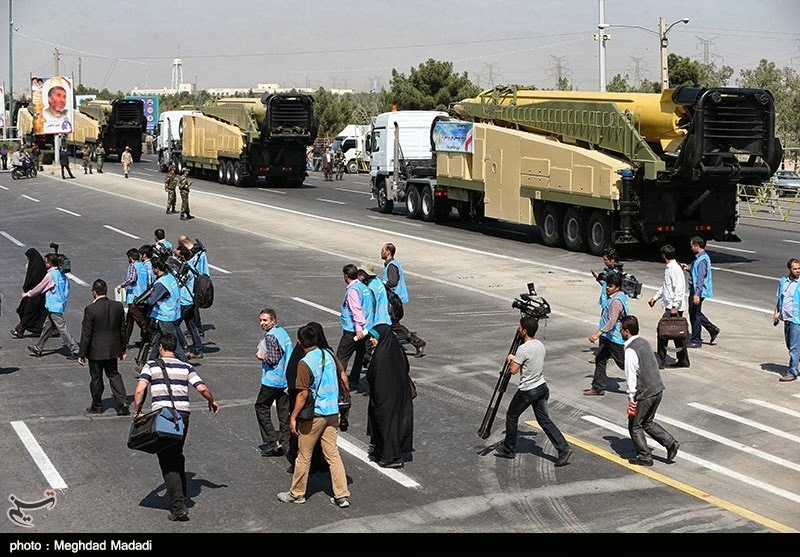 The problem with this theory is, neither of these are the types of launchers that could fire 140mm rockets. The top video shows the Type-63 multiple rocket launcher, which launches 107mm rockets, and the bottom video shows the Croatian RAK-12 multiple rocket launcher, which fires 128mm rockets. 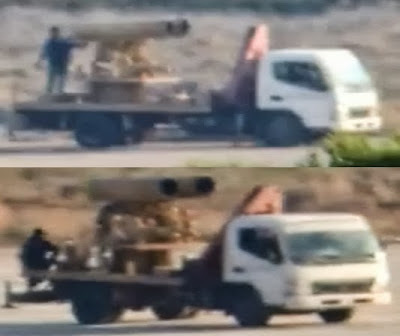 There's also been a number of DIY rocket launchers shown in opposition videos, but I've never seen evidence of 140mm rockets fired from those either. One thing that would stand out right way about 140mm rockets is the number of nozzles on the rear of the rocket. Unlike many other types of rockets, they have 10 nozzles, so they are pretty easy to spot. Evidence may exist, and if it does I'd love to see it, but I've yet to see any. Something that's pretty easy to spot. I'd also highly recommend watching the following video, published before the report, discussing the munitions used, in particular the M14 140mm artillery rocket. In particular I recommend watching the section on the "179" marking found on the remains in Damascus, from 6:18 onwards, which details it's origin in the former Soviet Union. More details of the origin of the munitions in Siberia can be found here. 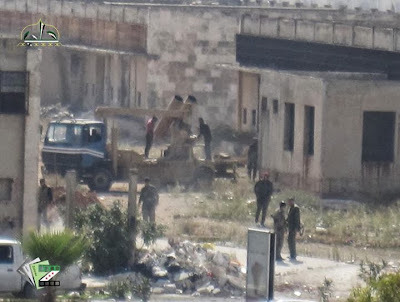 0:01 …….Assad’s dogs in Jobar by two “Ababeel” rockets, Wednesday 21th August 2013. The men in the video claim to be Liwa al-Islam, and the many flags in the video are also marked Liwa al-Islam. In the videos they are shown to launch the same unusual munitions (I've dubbed UMLACAs) used in the August 21st sarin attack. Obviously, this is meant to be proof that Liwa al-Islam were responsible for the August 21st attack, but there's a lot about it that seems dubious. 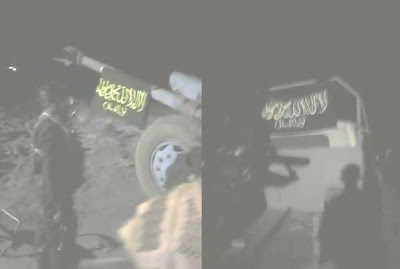 A look though YouTube channels used by Liwa al-Islam, here and here, doesn't seem to show videos where they've draped black flags over the weapons they are using, as seen in these new videos, and the new videos also don't appear to have the Liwa al-Islam logo anywhere, which they do seem to like plastering all over their equipment. It's also a bit odd they'd cover everything with the logo, yet film it using such a poor quality camera. It's not the only thing the rabbit video has in common with the new videos. In the rabbit video it's stated at 6:44 that the name of the group is the "Reeh Sarsar" (Cold Wind) Chemical Battalion, with the flag on the wall showing the same name. As I noted in the above transcript, the third video calls the Operation "Reeh Sarsar" (Cold Wind), exactly the same name as the group in the rabbit video. Those videos were not published on our official channels. They are thus forged and completely fake. 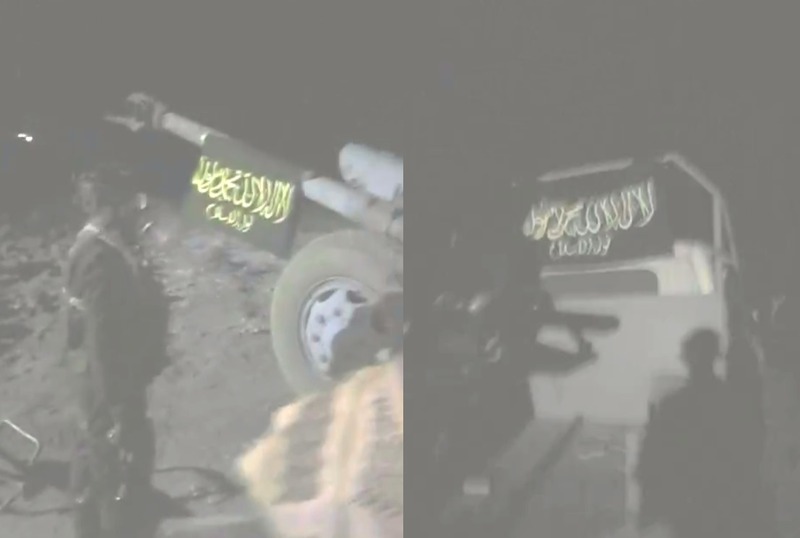 Liwa al-Islam does not have the kind of artillery shown in the videos. Only the Assad regime has this capability. Furthermore, this kind of artillery cannot in any way carry warhead that might be filled with chemical weapons. Only the Assad regime has chemical weapons in Syria. Assad admitted to that by agreeing to turn over his stockpile of chemical weapons to the international community. The UN team report, moreover, confirmed the rockets used in the attacks on August 21st were launched from regime-controlled areas. In the targeted areas in Gouta, there was a battalion affiliated with Liwa al-Islam. Ten soldiers of this battalion were killed and around 50 were injured. The regime has also fabricated a video showing members of Liwa al-Islam beheading soldiers. We stress that this is a mere cheap lie. Liwa al-Islam denounces this kind of behavior, and it is not part of its policy to execute detainees. Liwa al-Islam pledges to continue the fight to rid the country of the filthy terrorist regime. We will not be weakened by videos faked by those who have the blood of innocent people on their hands and those who used chemical weapons against innocent civilians. We will continue the fight until we bring the criminals to justice. Liwa al-Islam emphasizes that any political solution that does not involve accountability for crimes against the Syrian people is completely unacceptable. The world has forgotten all crimes by the Assad regime and focused only on the use of chemical weapons. When the international community makes a deal with Assad to eliminate his stockpile of chemical weapons and then hands him a certificate of good conduct, which puts him in a position to freely continue killing with other means, it becomes a partner in Assad’s murderous crimes. Update Enhanced versions of the videos can be found here. In light of today's report from the UN confirming the use of sarin in the August 21st attacks in Damascus, I thought I'd take a look at the open source evidence of who is responsible. I'll be looking at evidence that's freely available for anyone to examine, rather than what German spy boats may or may not of heard, or intelligence reports that tell us they have evidence, but don't actually show the evidence. As always, evidence does not automatically equal proof, so it's up to you to decide if this information proves one side or the other was responsible. 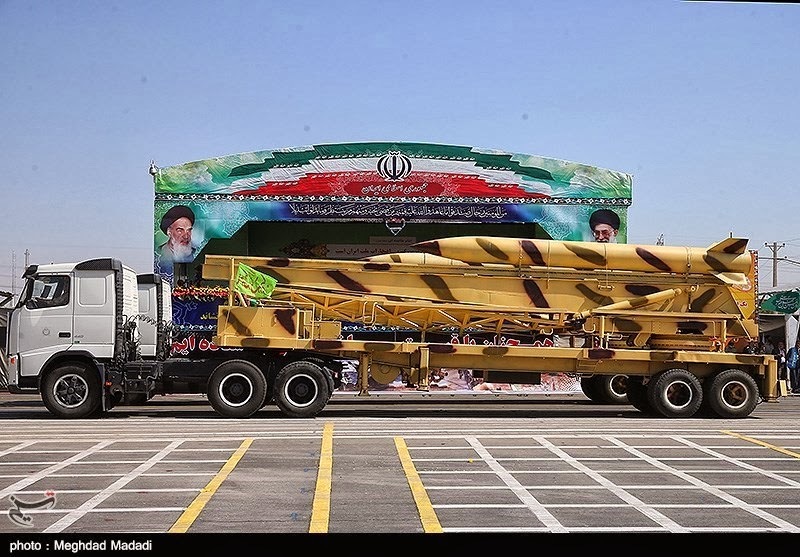 Two munitions have been linked to the attack, the M14 140mm artillery rocket, and a munition I've previously referred to as the UMLACA (Unidentified Munition Linked to Alleged Chemical Attacks). As with the M14, there's no evidence the Syrian opposition has access to, or have used, the UMLACA. 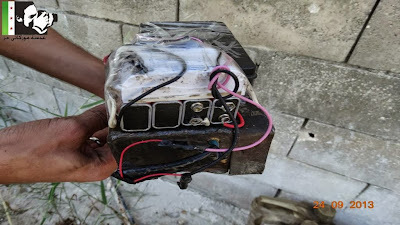 Since January 2013, a number of photographs and videos of these munitions have been published by opposition activists, who have consistently claimed these were fired by government forces. 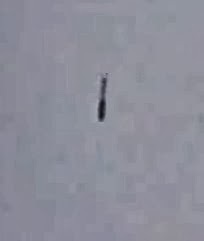 The first video, posted from Daraya, Damascus on January 4th 2013, doesn't even link the munition to a chemical attack, and through the last 3 weeks of investigations on the munition, I've established there are at least two types of this munition; the type linked to the August 21st attack and other alleged chemical attacks, and a high explosive type, which I examine in this post. It's important to note that the UMLACA has also been recorded at the scene of at least one other chemical attack, including one in Adra, Damascus, on August 5th, which I detail here. 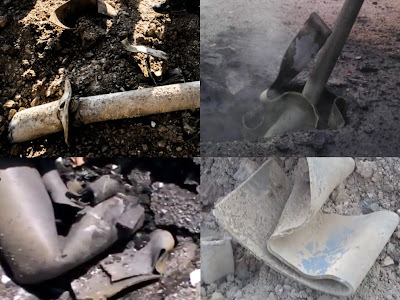 Another video, from June 11th, also filmed in Adra, shows the remains of an UMLACA that's described as a "chemical rocket", although it's not specified which alleged chemical attack it was linked to. Considering the new information presented in today's UN report, it seems worth re-examining some of the earlier allegations of chemical attacks in Syria. The above video is what's known as a "Hell Cannon", a popular mortar type weapon used by the Syrian opposition. I've gone into more details about the Hell Cannon, and why it's not a chemical weapon, as some people have claimed, here, but there is one other aspect of it I want to explore in relation to the UMLACAs. As I've said before, some people have claimed the UMLACA could be a DIY munition manufactured by the opposition, but by examining the construction of both the Hell Cannon and the UMLACA I think it's clear there's a very significant difference in the quality and complexity of construction. The design has had a slight improvement, with extendable tail fins added, and large numbers of the munitions being produced. If these were all chemical weapons then it's pretty clear someone would have noticed by now, and this really demonstrates how basic the design of these munitions are, something that's reflected in pretty much all the munitions produced by the opposition. These are just a couple of examples of the design quality of the munition, demonstrating this is something that's beyond anything the opposition has manufactured themselves, strongly indicating this is something that's been manufactured by the Syrian military, or one of it's allies. More examination of the construction of the munition can be found here. It was also possible to find the precise location of one of the munitions fired, and deduce it was fired from the north, the same direction as the 155th brigade missile base, and related sites (detailed here). This is the evidence that the Syrian government was capable of the attack, and had a history of using the munitions linked to the attack. As for evidence of Syrian opposition responsibility, that appears rather thin on the ground. You have claims the attacks were faked, the victims being Alawite hostages from Latakia, that were somehow driven through hundreds of miles of contested and government controlled territory to Damascus. There's claims that this was some sort of accident involving Saudi supplied chemical weapons, which fails to explain how one incident could effect two separate areas. Other claims centre around the opposition having sarin, based off reports in Turkey in May, where it was reported Jabhat al-Nusra members were arrested with sarin. The "sarin" was later reported to be anti-freeze, and only this week some of the members are being prosecuted for trying to make sarin, having only a shopping list of ingredients, rather than actual sarin. It seems to me, that compared to the evidence of government responsibility for the attacks, the evidence of opposition responsibility seems very poor.